Description: This exceptional Honyama polish stone was mined prior to WW2. It is a large stone - approx. 205mmx75mmx40mm (8.1in.x3in.x1.6in.). Stones of this size and quality were always rare. Today, these stones are unheard of. This ecru toned natural polish stone will leave a beautiful mist and haze finish and is perfect final polish stone. With a little practice you will be amazed at how sharp you can hone your fine blade. You can use it with or without slurry and it will give fantastic results. This stone was quarried in the mountains north of Kyoto. These stones are very fast cutting and provide an exceptional polish. This stone has some very minimal surface scratching that is easily made up for by the homogenous grit of the stone. 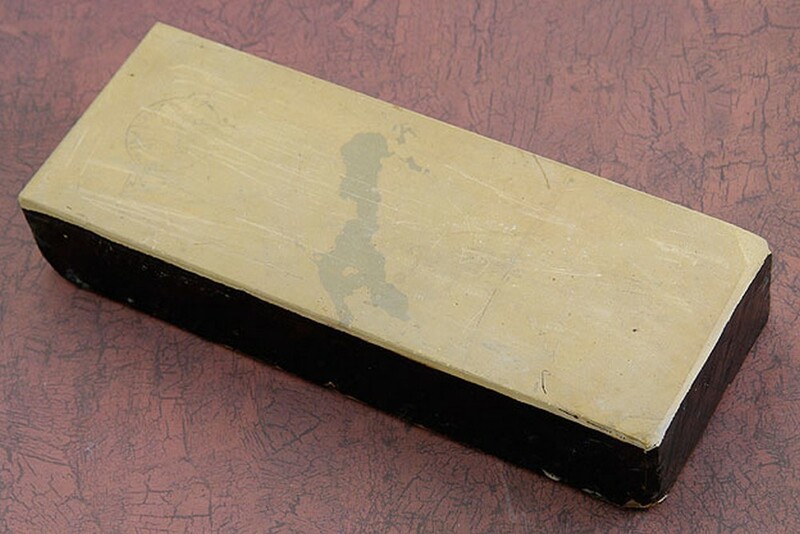 Despite the excellent performance of synthetic stones, many experienced sharpeners still prefer natural stones for sharpening their finest blades. Natural stones can bring out a blade’s full potential and allow the sharpening process itself to become a pleasant ritual. The finest stones from the Honyama quarries around mount Atago in the Kyoto area are becoming increasingly difficult to find. 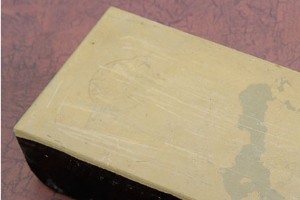 Natural Japanese stones are soaked in water prior to use but should not be stored in water like some synthetic stones. Following best practices, the sides of this stone have been lacquered. This aids the stone to keep structural strength while soaking. Natural stones have slight natural imperfections and may vary somewhat in size. You will find that different parts of the stone can work steel differently. Through experience with a stone, you find what might be considered a sweet spot.